It is always a lucky day when we are recognized by the community for the work we do. Our fight against the negative outcomes that children in foster care often face is a tough one and we need all the resources that the community can provide. 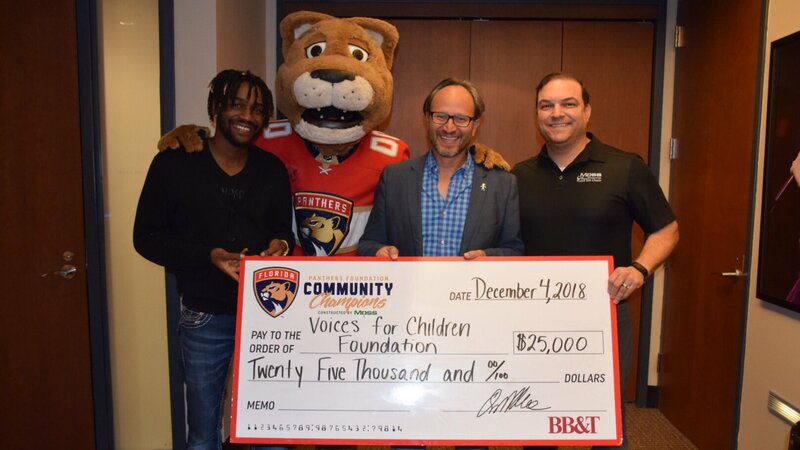 That is why when organizations such as the Florida Panthers and MOSS Associates, two of the largest and most influential groups in our South Florida community decide to support Voices For Children, it is indeed an incredibly lucky day. 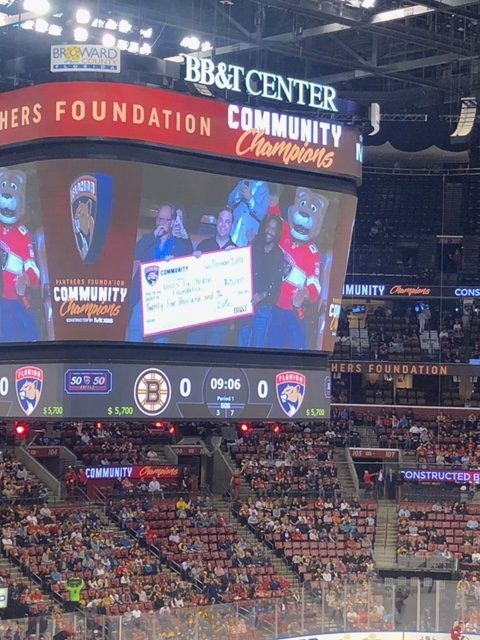 On Tuesday, December 4th, 2018, Voices For Children had the honor of being selected as the evening’s Community Champions Program Grant recipient at a Florida Panthers’ game against the Boston Bruins at the BB&T Center. Voices For Children Foundation was celebrated and one of our very special success stories, Isriel Mitchell, had his story about his journey through foster care featured on the jumbotrons during intermission. Also featured in the story was how Voices has made an impact on his life by not only providing financial assistance but also the motivation and emotional support he needed to help him obtain his high school GED and start college this Spring. The Panthers were victorious against the Bruins but more so were youth in foster care in Miami-Dade County. It was an amazing night for everyone in attendance and in addition to the incredibly generous exposure of our organization and the work we do, Panthers and MOSS Foundation awarded Voices For Children with a check for $25,000. Now we can look forward to continuing our work with other foster youth by recruiting and training Guardians ad Litem; specialized advocates who serve as the voice for children navigating the foster care process. 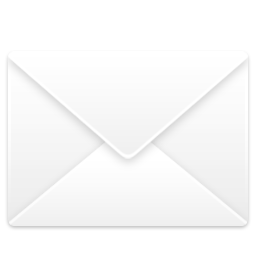 It is a lucky day for youth who are experiencing foster care when they are given a Guardian ad Litem to ensure that they don’t linger in dependency and that their needs are being met. Thanks to these amazing organizations for the recognition and generosity they have shown in order for us to help keep providing lucky days for vulnerable youth.